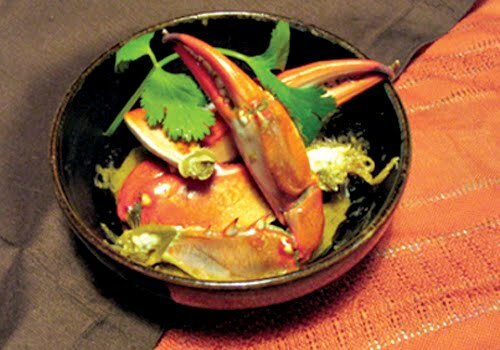 8 medium crabs – cleaned, 8 tbsp coconut – grated, 10 dry red chillies, 2 tbsp coriander seeds, 10 black peppercorns, 4 cloves, 2 tbsp oil, 2 onions, medium, sliced, 1 tsp ginger-garlic paste, 1/4 tsp turmeric, 1/4 tsp tamarind juice, 2 green chillies chopped. Roast the coconut lightly and clear the pan. Roast the chillies and then the spices. Grind 1 and 2 to a fine paste with little water. Heat the oil and brown the onion. Stir in ginger-garlic paste and turmeric, fry for few seconds. Add the crabs, mix well and sprinkle tamarind juice. Add half cup of water, cover and cook for 10 minutes. Stir in the roasted spice paste, salt and green chillies. Cook till preparation is thick. Best served with Rice when it is hot.